The Rolls-Royce Turbomeca Adour is manufactured by Rolls-Royce in collaboration with Turbomeca. The engine was originally developed to power the SEPECAT Jaguar, an Anglo-French jet ground-attack aircraft which entered service in 1973. The Adour is a two-spool turbofan engine available in both afterburning and non-afterburning variants. The Mk871 (U.S. designation F405-RR-401) Adour powers both ground-attack and advanced trainer aircraft, including the SEPECAT Jaguar, Mitsubishi T-2 and F-1 aircraft, BAE Systems Hawk, and the Boeing T-45 Goshawk. The Adour is a rugged and easy-to-maintain engine, which has earned its reputation as a proven and dependable power plant for ground attack and advanced trainer aircraft. 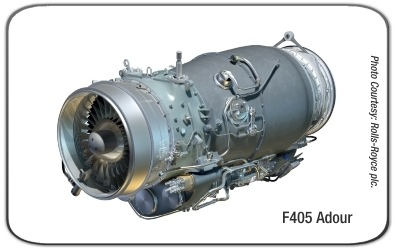 The Adour Mk951 (U.S. designation F405-RR-402) is the newest version of the non-afterburning range of Adour engines. It powers the BAE Systems Hawk and the T-45 Goshawk military trainer aircraft. The Mk951 provides increased thrust, reduced life-cycle costs and greater performance through the addition of a FADEC (Full Authority Digital Engine Control) system. The Adour also powers BAE Systems' Taranis and Dassault's nEUROn combat UCAV technology demonstrators. The Adour Mk106 is the newest version of the afterburning range of Adour engines and is the replacement for the SEPECAT Jaguar's Mk104. The Mk106 design features an Adour Mk871 engine with an Mk104 reheat system and provides a substantial increase in performance. To date, more than 3,000 Adour have now been sold in nine different countries. The worldwide Adour fleet has accumulated more than eight million flight hours. Sources Used: U.S. Department of Defense (DoD), Rolls-Royce plc and Safran.